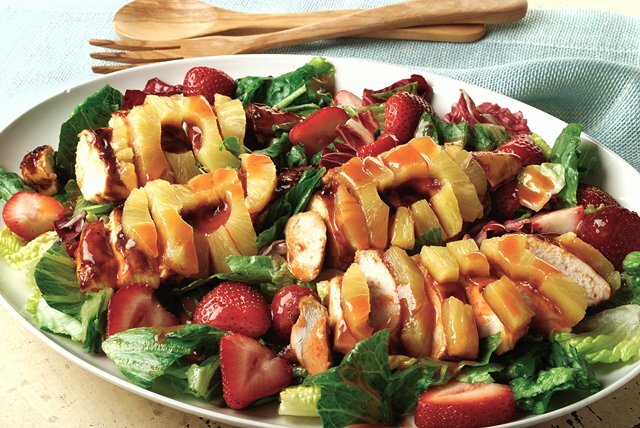 Baste chicken breasts with BBQ sauce and broil with pineapple, then slice and serve over mixed greens and strawberries to make this sweet and savory salad. Broil chicken 4 inches from heat 20 to 25 min. or until chicken is done (165ºF. ), turning and brushing frequently with barbecue sauce for the last 15 min. and adding pineapple for the last 5 min. of broiling time. Arrange greens and strawberries on serving plate. Top with chicken and pineapple. Serve with dressing. Prepare using fresh pineapple rings.